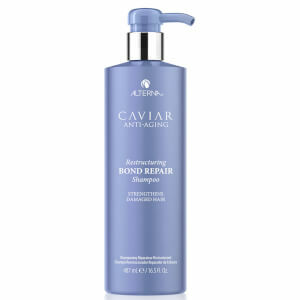 Strengthen and rebuild damaged hair with Alterna Caviar Anti-Aging Restructuring Bond Repair Conditioner, a reparative conditioner formulated with Caviar Bond Enforcing Technology to seal and protect tresses that have been damaged through chemical processes or physical stress. 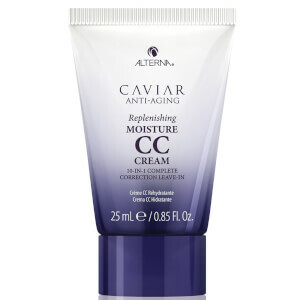 Working to reduce breakage and protect against future damage, the nourishing conditioner utilizes Caviar Extract (one of nature's richest sources of Omega-3 Fatty Acids) to help restore moisture, elasticity and shine, while a proprietary Age-Control Complex provides antioxidant protection to encourage healthy-looking locks. 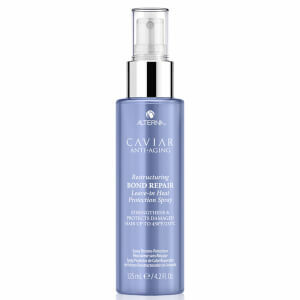 Enhancing hair's strength and resilience, the conditioner also contains a vegetable-derived protein and silicone blend (Hydrolyzed Vegetable Protein PG-Propyl Silanetriol) to fortify and revitalize dry and damaged hair. 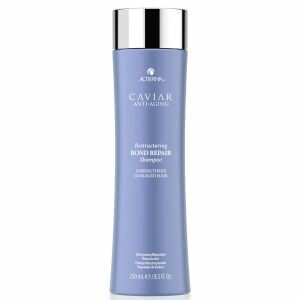 Free from sulfates, parabens, gluten and synthetic color. Water/Aqua/Eau, Phenyl Trimethicone, Behentrimonium Chloride, Cetyl Alcohol, Stearyl Alcohol, Cetrimonium Chloride, Behentrimonium Methosulfate, Cetearyl Alcohol, Dimethicone, Fragrance (Parfum), Hydrogenated Castor Oil/Sebacic Acid Copolymer, Benzyl Alcohol, Glycereth-26, Guar Hydroxypropyltrimonium Chloride, Tocopheryl Acetate, Dehydroacetic Acid, Alaria Esculenta Extract, Caprylic/Capric Triglyceride, Citric Acid, Hydrolyzed Vegetable Protein PG-Propyl Silanetriol, Butyrospermum Parkii (Shea) Butter, Helianthus Annuus (Sunflower) Seed Oil, Jojoba Esters, Linum Usitatissimum Seed Oil, Polysilicone-15, Superoxide Dismutase, Hydrolyzed Rice Protein, Caviar Extract, Potassium Benzoate, Propylene Glycol, Sodium Sorbate, Leuconostoc/Radish Root Ferment Filtrate, Saccharomyces/Copper Ferment, Saccharomyces/Iron Ferment, Saccharomyces/Magnesium Ferment, Saccharomyces/Silicon Ferment, Saccharomyces/Zinc Ferment, Phospholipids, Hexyl Cinnamal, Linalool, Limonene, Geraniol, Coumarin, Citral, Amyl Cinnamal, Benzyl Benzoate, Benzyl Alcohol, Citronellol.